As a young guest shouts that they have a, “Fish on!” Everyone runs to help them unhook the shiny fish and snap a quick picture. Guests and staff alike giggle as the little fisherman’s arms stretch wider and wider each time they tell the story of their catch. Here at Greenhorn Ranch we love to share the experience of fishing in all shapes and forms. Whether you are casting with one of our kid poles or advance to the fly fishing course with Mike Pease; the fish are biting! Worms caught fresh from our worm farm prove worthy of baiting the rainbow trout and bass that dwell in our ponds. While using barbless hooks many enjoy the thrill of catching, reeling and releasing fish each day. Whether guests choose to fish during the early morning, afternoon or through the evening, the experience is one to be remembered and cherished. Some even choose to purchase and clean their catch and ask the kitchen staff to cook it for dinner! Everyone at the ranch is happy to partake in this (for some) first experience! 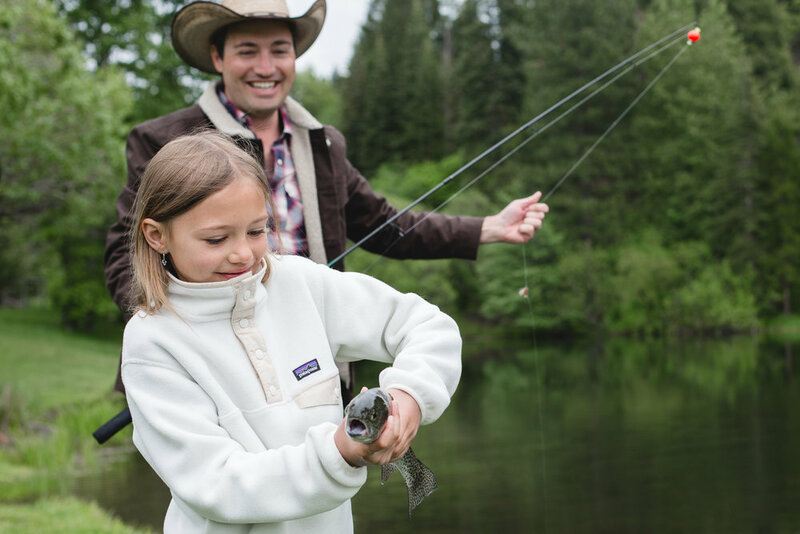 Join us at Greenhorn Ranch for a day filled with great fishing, we know you will be hooked!